In the sixth book of Julia Keller's Bill Elkins series, Prosecutor Bill Elkins searches for the drug source that's causing the heroin epidemic in his Appalachian hometown. 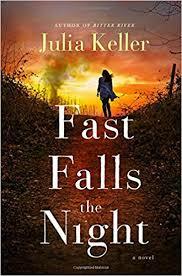 Julia Keller doesn’t pull any punches in Fast Falls the Night. In the course of a single day, there are 33 overdoses (three of them fatal) in Aker’s Gap, the Appalachian town in West Virginia where she sets all her regional mysteries. The putative cause of this horrendous business is a batch of tainted heroin... The plot pretty much consists of waiting for the next OD victim to keel over, but Keller does a terrific job of rubbing our faces in the troubles of her hometown — of America’s hometowns. Julia Keller’s gritty series on overworked county prosecutor Bell Elkins introduced readers to the economically and emotionally depressed community of Acker’s Gap, W.Va ... Fast Falls the Night is peopled with other conflicted characters... The inhabitants of this day-in-the-life book experience unavoidable, existential change — as, it seems, did the book’s author, a Pulitzer Prize-winning Midwestern writer who herself grew up in a small West Virginia community since ravaged by drug addiction. ...Fast Falls the Night, a truly riveting work that has provided me with the impetus to seek out the preceding volumes of this fine series ... It begins with the death of a young woman in a convenience store restroom just after midnight. It continues, with overdoses across the somewhat narrow class and income demographics of the small town ...is a story that is complete in itself but will have repercussions that undoubtedly will shape and affect future storylines in the series ...it attempts to discuss an issue that is being raised with more and more frequency: that being whether saving habitual drug offenders –– bringing them back from the brink of death following an overdose –– is a worthwhile endeavor, particularly for those who routinely put their own lives in danger ... This novel presents both arguments very well, which is as it should be. What did you think of Fast Falls the Night?